Is there a reason for the "^p" rather than using urlencode() and urldecode() which are intended for these things? Maybe your form-encryption is doing some odd stuff? 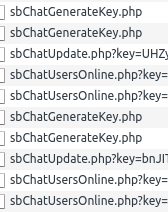 Why are you requesting a new chat key each second? Isn't that a bit nasty regarding server load/requests-count? These "I am alive and still the same" could be done way less often - and/or before user interaction happens (so check on sending a new line rather than periodically). I don't use "^p"? - I use urlencode() / urldecode() amongst other things. Basic idea is to use WebSockets to allow communication between Server->Client. So instead of your current "client polls server for changes" it becomes a "server informs clients of changes". That is correct. Calling for a key uses minimal resources so I'm fine with that. If the chat ever gets like 50+ users in regularly ( highly doubtful ) then it will be recoded to a more efficient system. I understand, that you request the key again each 3 seconds - but assumed 1 request/3 seconds would be enough. Oh I see what you are referring to.. On the version being uploaded tonight it doesn't go mad with key requests. Most of those calls should of been removed days ago, I just forgot about them. 1.. You *should* no longer be logged out at random times. 2.. The chat sounds can now be turned on / off via the new shiny checkbox. 3.. Under the hood - Far less external calls are made to scripts. Thanks to Derron for pointing out there were excessive calls. There were some I knew about about but others I'd forgotten about during the initial coding of the chat room which should of been removed from day one. There are still a couple of bugs to fix and a new face lift coming but it's progressing. There is no announcement for users leaving the chat. I was about to post that Derron and I have been kicked and reentered several times. Definitely seems to be some issues when people are actively chatting or something. I chatted with Dabz a while and did not encounter that - so probably this is Qube doing things on the server. PS: Closing a chat window does not remove you from the list so soon, doing a /quit is immediately removing the user. Still need to add an on close event.